This summer, we have been highlighting the various mortgage products that are available to you. We've already covered FHA Loans, Construction & Lot Loans, USDA Loans, and Short & Sweet. Today, we're going to talk about VA Loans. 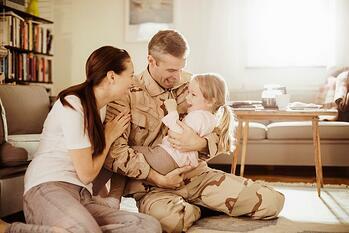 Veteran Affairs Loans are a loan option for veterans, service members, and eligible surviving spouses. These loans are guaranteed by the US Department of Affairs as way to help those who are qualified to buy a home. > 90 consecutive days of service during active wartime. > 181 days of active service during peacetime. > More than 6 years in the National Guard of Reserves. > Been the spouse of a service member who died in the line of duty or of a service related disability. > Usually requires no down payment. > Can be paid off early without penalties. Not sure which mortgage product will work best for you? Contact one of our experienced home loan advisors. They will sit down with you, take a look at your finances, and find the product that fits you. To set up a meeting, call (801) 260-7600 ext. 5340 or click HERE.